Please visit site to see the video! HOMESTEAD, Fla. -- Florida's Burmese python problem has taken center stage over the past month. About 150,000 are believed to slither though the Everglades. While a state sponsored hunt is one solution to the problem, a reptile expert says preventing further snakes from invading Florida is key. Beyond a rather discreet entrance lies an exotic world. Animals of all kinds call the Everglades Outpost, a sort of makeshift jungle, home. "We deal with everything from lions and bears to raccoons," said herpatologist Albert Killian. Killian is in charge of the Outpost, an exotic wildlife refuge in Homestead. The animals at the Outpost didn't come from zoos and were not found injured in the wild. Instead, Killian says 90 percent of them came from negligent pet owners. "Each animal has a different story," he said pointing to a lemur whose owner removed his teeth after he bit someone. A few cages down rests a panther. "She's the product of a drug bust," said Killian. Some new arrivals have a different story. Pythons, Killian says, are the latest refugees of the exotic animal market. "In the past month we've had 20 people drop off their snakes here," said Killian. 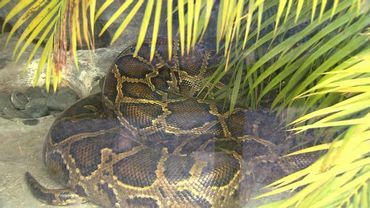 They started coming in around the time a 2-year-old was strangled by a pet python in central Florida. The drop-offs have continued since last Friday's state-sponsored python hunt began. "People are being responsible here doing the right things by dropping them off instead of releasing them into the wild," said Killian. If you are the owner of a python, Killian says there aren't many legal options for getting rid of the snake. Killian says you can drop a snake off at the Outpost seven days a week, no questions asked. According to Florida Fish and Wildlife, the python problem began with pet owners releasing the invasive species into the wild. It's estimated over 150,000 pythons now live in the Everglades. Killian says the key to eradicating the invasive species isn't just hunting, but also stopping people from releasing them. "Right now the numbers are just out of control," Killian said as he grabbed hold of a 13-foot albino python, the latest snake to be dropped off. "She's only two years old. She can grow twice this size." Killian can take in a few hundred snakes before he'll have to begin killing them. The FWC says prospective pet owner's looking to buy a baby python will have to apply for a permit and have a tracking chip implanted in their snake. Killian says while it's unclear if pet owners will continue to illegally release snakes, he adds FWC regulations seem to be discouraging people from buying Burmese pythons. Florida should do what they did in Connecticut - have an Exotic Animal Amnesty Day so owners who have non-domestic pets they can't care for can bring them to a zoo that will either keep them or send them to nature centers or educational groups that will care for them properly. Good advice on this Tom. Thanks Raffi. This is good. I heard they were paying people to shoot or kill any python they found in the wild in Florida. This reminds me of the snakehead fish problem we had here in Md a few years ago. This sanctuary needs to update their website! I'd like to get their newsletter, to keep up on what's going on with them, but there's no way to sign up . . . I really think the solution is to make the import of exotic animals illegal and to keep them out of pet stores. I also like the idea of an amnesty day where people can turn them in. basicly this sancturay is a amesity day. they are taking snakes no questions asked. the problem is there are more snakes than places to legaly take them. it is sad how poeple want to buy exotic animals like snakes and than when they get too big to handle just throw outside to fend for themselves and cause problems. humans are bad about throwing away all types of animals they tire of. look at the packs of stray dogs, colonies of feral cats, now snakes in FLA. people need to start being more responsible and using thier heads.